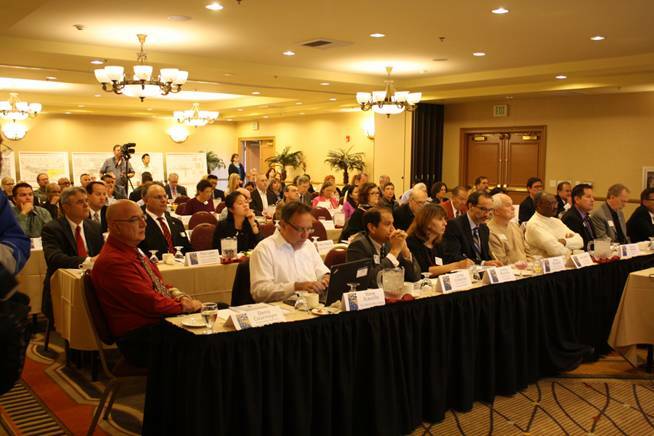 Attendees at yesterday’s event for the Gold Line Foothill Extension. The Metro Gold Line Foothill Construction Authority held held an event Wednesday in Claremont to announce the start of further planning and conceptual for the Azusa-to-Montclair phase of the project. An 11.5-mile extension of the Gold Line between eastern Pasadena and Azusa is currently under construction with Metro forecasting an opening in early 2016. An extension beyond Azusa is in Metro’s Long Range Transportation Plan but is not funded at this time. The Metro Board earlier this year, however, did approve a concept that allows for up to $36 million of Measure R funding (Measure R is funding the Pasadena-to-Azusa segment plus a new rail yard in Monrovia) to be used for planning, engineering and environmental work for the segment beyond Azusa. CLAREMONT, CA – Today, the Metro Gold Line Foothill Extension Construction Authority (Construction Authority) hosted a kick-off meeting for the much-anticipated Azusa to Montclair segment of the Metro Gold Line Foothill Extension light rail line. The 12.3-mile project will extend light rail service from the current terminus under construction in the city of Azusa, to the cities of Glendora, San Dimas, La Verne, Pomona, Claremont and Montclair. Presenting to a capacity-filled room of federal, state and local officials, station artists, and key stakeholders, a panel of four speakers provided details on the next steps in the process to advance engineering and station art for the project. The panel – consisting of Construction Authority CEO Habib Balian, Chief Project Officer Chris Burner, Station Environment Coordinator Tanya Patsaouras, and Public Art Program Manager Lesley Elwood – provided the attendees updates on the latest station design criteria, choices cities will have regarding station colors and materials, the schedule for advanced conceptual engineering and station art development, and much more. A Locally Preferred Alternative was selected earlier this year by the Construction Authority board of directors, following environmental review and clearance of the project under the California Environmental Policy Act (CEQA). Since that time, the Construction Authority has developed the scope of work to advance the necessary design, engineering and station art planning. The agency is set to begin the advanced conceptual engineering early next year. About the Metro Gold Line Foothill Extension – The Metro Gold Line Foothill Extension is a $1.7 billion, 24-mile extension of the Metro Gold Line light rail system, being overseen by the Metro Gold Line Foothill Extension Construction Authority, an independent transportation planning and construction agency created in 1998 by the California State Legislature. The project is planned in two segments – Pasadena to Azusa and Azusa to Montclair. The Pasadena to Azusa segment is fully funded by Los Angeles County’s Measure R and is on schedule to be completed in September 2015, when it will be turned over to Metro for testing and pre-revenue service. Measure R is funding the majority of cost for advanced conceptual engineering and environmental work necessary for the Azusa to Montclair segment (San Bernardino County will fund their portion of the work). Construction funding has not been identified for the Azusa to Montclair project. The Construction Authority is working with Metro to seek the nearly $1 billion needed complete the Foothill Extension to Montclair. i had submitted this question for Metro Live last week, but it bears asking again. i give credit to the foothill communities for pushing really hard for the next extension. it shows there is a real interest and desire for public transit. just wish the Eastside Extension got that much attention. i read a while back ago that the Eastside extension is lacking further behind in terms of ridership and that Metro was exploring ways to speed up this segment of the Gold Line. the question i had asked is whether we will see another Foothill extension before we see the next phase of the Eastside Gold Line extension? and is that fair to the people in those communities. Under Measure R, the Foothill Extension was planned to be built first. The extension of the Eastside Gold Line is a second-decade Measure R project. There was an item earlier this year concerning improving ridership on the Eastside segment that opened in 2009. The issue involves riders who would rather take the bus that travels directly into downtown. The Regional Connector should remedy that when it opens, currently forecast for 2020. Although on this page the title of the item and the content match, on the email notification of the post of the entry, the title refers to a bus and streetcar in Glendale while the content is as above. Something went wrong! I had the wrong headline on the wrong story initially. Too many tabs open on my browser. It was quickly fixed. A good article about the Gold Line 2b and the overall transit desires for the SGV from the Pasadena Star. The article that Warren links to states that Metro is the parent agency of the Gold Line Extension Construction Authority. I thought they were completely independent of Metro? While it is always nice to see the enthusiasm for rail transit, the ridership numbers on this line will make it an albatross around the neck of Metro’ s operation budget for many years. Why, for example, is there no station planned for the Lone Hill Park and Ride area where the line crosses the junction of the 210 & 57 freeways? Does the line really need to go beyond LaVerne/North Pomona, given the existence of Metrolink and FT buses to Montclair, and the coming closure of passenger services at Ontario airport?